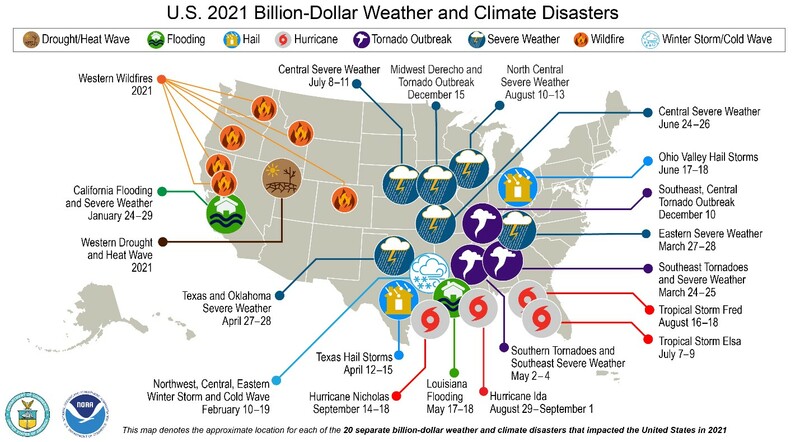 The number of weather and climate disasters in the U.S. in 2017 and 2018 with losses exceeding $1 billion. 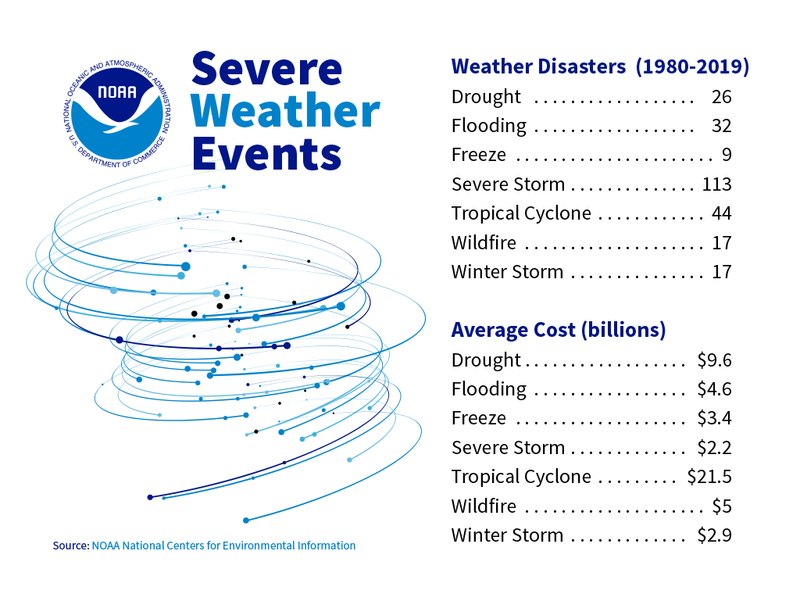 The total approximate cost of damages from weather and climate disasters in the U.S. since 1980. The annual average number of weather and climate events from 2014 to 2018. In 2018 alone, the U.S. experienced 14 billion-dollar disasters. Of the 14 billion-dollar weather and climate disasters in 2018, there were two tropical cyclones (Hurricanes Florence and Michael), one western wildfire disaster comprised of several fire complexes, eight severe convective storms (hail, tornado, or damaging wind), one large drought episode, and two winter storms. In total, these events claimed at least 247 lives and had losses estimated at $91 billion. Hurricanes Michael and Florence, and the western wildfires, accounted for about $73 billion of that. Hurricane Florence: Florence made landfall near Wrightsville Beach, North Carolina, on September 14, 2018 and became one of the deadliest and costliest hurricanes to ever impact the Carolinas. 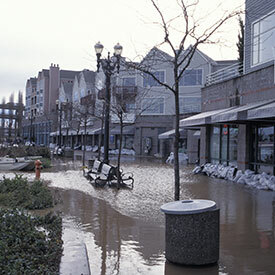 It caused at least 51 deaths and record flooding. Hurricane Michael: Michael made landfall near Mexico Beach, Florida on October 10, 2018, with sustained winds of 155 miles per hour. It was the most intense hurricane on record to make landfall along the Florida Panhandle, and caused at least 45 deaths—as well as widespread devastation—across the Panhandle, Georgia, the Carolinas, and Virginia. Western Wildfires: Two wildfires impacted California in early November 2018; the Camp Fire burned more than 153,000 acres, caused at least 88 fatalities, and destroyed more than 18,000 structures in Northern California. It was the most destructive and deadliest wildfire on record in California, and the deadliest wildfire in the U.S. since 1918. In Southern California, the Woolsey Fire destroyed more than 1,500 structures and killed at least three people in and around Malibu. Hurricane Harvey: Harvey produced 60.58 inches of rainfall in Texas, the most ever recorded in the continental U.S. from a tropical cyclone. It was the first category 4 hurricane to make landfall in Texas since 1961, and the first category 4 to make landfall in the U.S. since 2004. Harvey lasted 117 hours, beating the previous record for duration of Hurricane Fern in 1971. Hurricane Irma: With maximum winds of 185 miles per hour, Irma became the strongest storm on record to exist in the Atlantic Ocean outside of the Caribbean and Gulf of Mexico. It sustained those maximum winds speeds for 37 hours and spent three consecutive days as a category 5 hurricane—making it the longest of any cyclone in the world ever recorded to maintain that intensity. The occurrences of Harvey and Irma—making landfall within two weeks of each other—were the first time in recorded history that two category 4 or higher hurricanes struck the U.S. mainland in the same year. Hurricane Maria: Maria was the first category 5 hurricane ever to make landfall in Dominica, and the strongest hurricane to make landfall in Puerto Rico since 1928. It was the deadliest of 2017’s three major storm, with over 500 fatalities. 2018 marked the eighth consecutive year with eight or more billion-dollar disasters, exceeding the long-term average of 6.2 per year. Of the 241 weather disasters since 1980, tropical cyclones have caused the most damage: $919.7 billion total, with an average cost of almost $22 billion per event.